At Alpine Truck Accessories, we will help you make sure you are protecting one of your biggest investments — your truck. After all, we are truck people ourselves. We want to make sure we help stop any damage that could happen to all parts of your truck. Backed by a lifetime warranty and a brand you can trust, put LINE-X up against any other truck bed liner and see why it’s the best choice. As the Williston’s premier LINE-X installers, we are qualified to ensure that your LINE-X bed liner is installed in the most beneficial way possible. Let us give you the absolute best protection through LINE-X. Alpine Truck Accessories knows your truck can be more than just a vehicle. Whether it’s your workhorse or your weekend escape means, it deserves serious protection no matter where you take it. Be sure to trust the toughest name in the business. Protecting millions of trucks worldwide for over 20 years, the LINE-X STANDARD spray-on bed liner has given truck owners just like you the peace of mind they deserve. Keep your liner looking new forever with our LINE-X PREMIUM Bedliner. We’ve combined our proven STANDARD formula with an added layer of UV protection, affording you premium protection at an affordable cost. 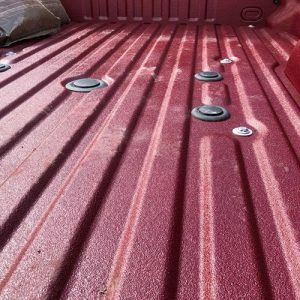 No matter the punishment the sun lays on your truck, your spray-in bedliner will stay looking brand-new. For over 20 years, the name LINE-X has become synonymous with toughness. This tradition includes LINE-X PRO — an advanced-formula, professional-grade bedliner with exceptional physical specs that make it a whopping 300 percent tougher than the industry standard. Take your truck protection to a molecular level with the LINE-X PLATINUM protection. We use pure polyurea technology to combine strength and flexibility, creating the toughest bedliner on the market. Toughness, durability, and UV stability all in one platinum package. No matter what your needs are, our off-road truck shop in Williston is here to help. We are proud to provide quality synonymous with the LINE-X standard, and all of our truck accessories are built to provide the best protection for the road ahead. Contact us today to learn more!